Shaking table for the separation of metals: Casiterite and columbite-tantalite separation (the black material) using a shaking table. 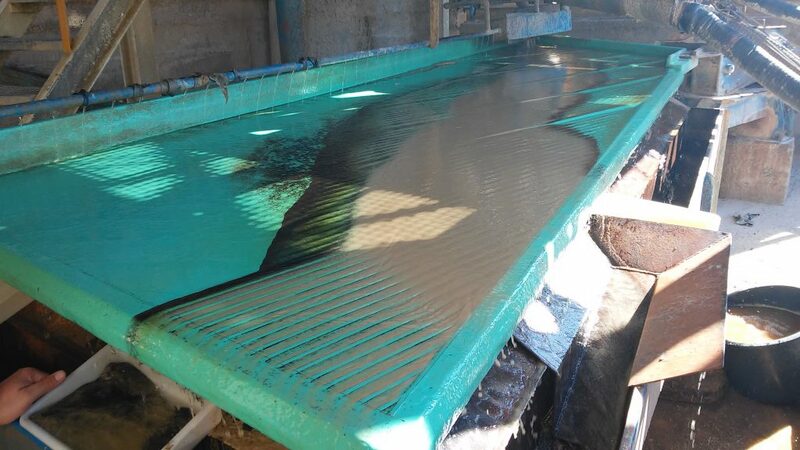 In the process of mining waste are used these shaking tables for the separation of metals from the rest of the sterile material. 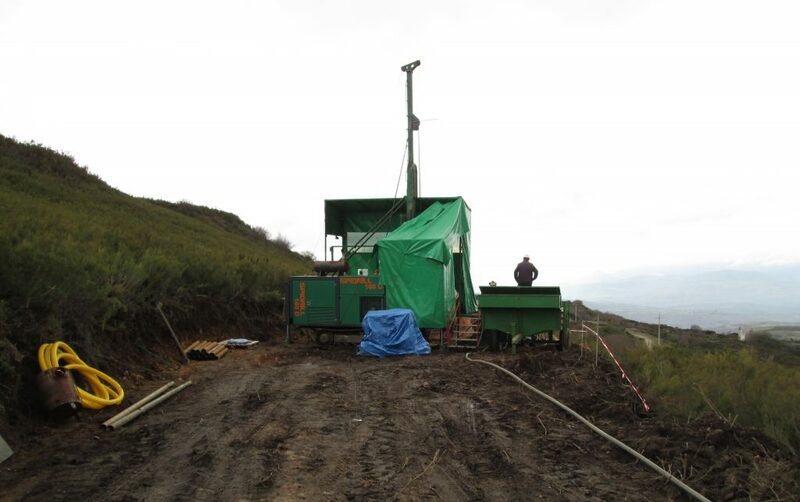 Geological exploration campaign: This photograph shows the realization of a drilling in the area of mining waste. Tim distribution in tailings dump: Representation of distribution of the concentrations of tin in the tailings pond, object of valorization. Study of the drill cores: This photograph shows studies of the drill cores and drill core logging. The Penouta Mine Project (Viana do Bolo, Orense, Spain) of Strategic Minerals Spain company expects to be a reference for sustainable mining, in which abandoned waste is valued and generates economic, environmental and social benefits under the framework of Circular Economy. The Penouta Mine was one of the most important tin mines in Spain. It had several owners and was definitively closed in 1985 without any restoration process. The exploitation was done in the open pit mining and in a very selective way. Mineral wastes were deposited in dumps and tailings ponds, which are nowadays without any type of restoration. These residues present concentrations of metals, such as tin, tantalum and niobium, as well as important quantities of industrial minerals. Strategic Minerals Spain has carried out numerous studies of exploitation and engineering of detail, designing an optimum, effective and efficient process with the resources, allowing the maximum use and valorization of these residues. The benefit of these mining wastes will begin at 2017. The treatment of tailings and dumps of the old Penouta mine will result in the benefit of nearly 1% of tin, tantalum and niobium metals, and 99% of mining tailings. The latter are mainly composed of silicate minerals that can be reprocessed, obtaining around 70% of industrial minerals, namely quartz, mica, feldspar and kaolin. In the overall process, the aim is to achieve a benefit of mining wastes around 80%. The final residue will be used as material for environmental restoration. In summary, starting from 1 ton of wastes we would obtain 10 kg of metals and 700 kg of industrial minerals, remaining 290 kg of tailings used in the restoration. Nowadays, a mining plant is being built in the Penouta mine. It is expected that its assembly is finished in the coming months, starting into production in the second half of the current year. In a first stage, the recovery of metals and some industrial minerals (e.g. micas) will be carried out, with a full recovery of the rest of industrial minerals in a not so far period of time, since SMS has several open lines of research for the improvement of the recovery of industrial minerals. In parallel, SMS is participating in other similar projects of environmental restoration, starting from tailings of abandoned mines. The incorporation of new lines of research for the continuous improvement in the benefit of existing wastes from the Penouta mine, together with the efficiency of available resources. The correct performance of the company in compliance with administrative authorisations and its commitment to sustainability and the environment. Contributing to a more environmental and social value in the area. The integration to the adjacent Natura 2000 natural space after restoration of the mining zone. When the Red Natura Peña Trevinca protected natural area was declared, the zone occupied by the abandoned Penouta mine was excluded of this area due to its low ecological quality. The future restoration of these abandoned mining wastes will result in an area with good ecological quality. A great challenge for the project consists of reaching a degree of quality that allows the area be part of the protected space.